The laying of a Rotary wreath at the Menin Gate in Ypres. 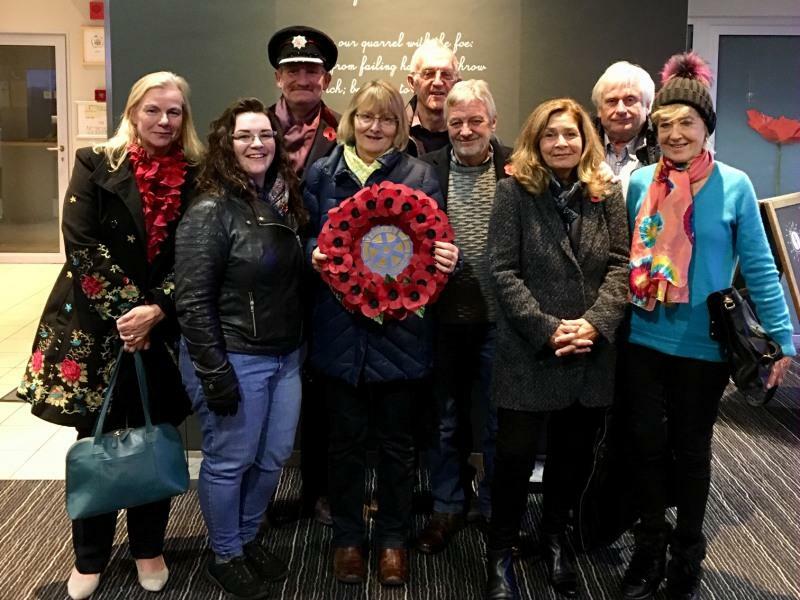 Over the weekend of 23rd to 25th November 2018, ten members and partners of Leatherhead Rotary Club travelled to France to attend the annual soirée organised by one of their two twin clubs, the Rotary Club of Lens Louvre. After staying in Ypres in Belgium on the Friday night, where they also laid a Rotary wreath at the Menin Gate, the Leatherhead party made their way across to the picturesque town of Gosnay, near Lens, on the Saturday afternoon, where, together with members and partners of their second twin club, the Rotary Club of Hannut Waremme in Belgium, they joined over 200 members and supporters of the Rotary Club of Lens Louvre, for the French club’s annual soirée, this year commemorating 61 years since the club was founded in 1957. Having danced until the early hours of Sunday morning, the group opted for a late breakfast the following day, before joining some of their French colleagues for lunch in a nearby restaurant and then making their weary way home to Surrey. More photos on the Leatherhead Club website!